Height with Optional Guard Rail: 94.50"
Seat Heights: (1) 16.25", (2) 24.25", (3) 30.25", (4) 38.25", (5) 46.25"
IMPORTANT: Please check local codes for aisles, guard rails, ADA or other requirements. It is the buyer's responsibility to check all bleacher specifications for compliance with all applicable codes. 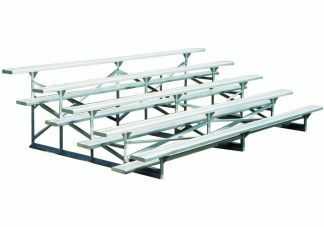 All outdoor bleachers should be anchored for resistance to wind.